Dudes we live in a messed up world sometimes. There is a lot of good, a lot of great stuff going on all around us but still ugliness has a way of seeping into everywhere. Unfortunately, geek culture is not immune to this. We are continuing to monitor changes to Convention policies. 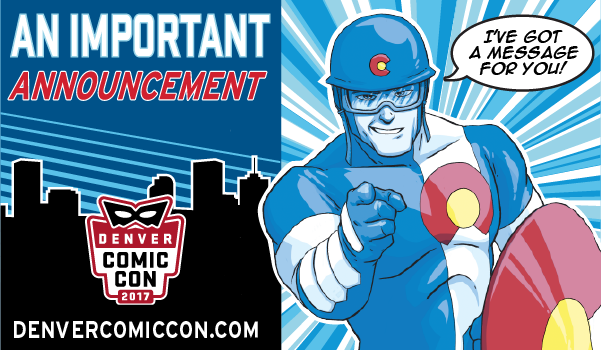 Denver Comic Con which begins at the end June just released a new policy and plan for entering the convention. The key component is that there is a BAG and Prop check. I wanted to highlight the word bag because I know I normally bring a bag to the con with comics and the like it it. This year if I do that I will need to go through the Bag and Prop line that will undoubtedly move much slower than the other lines. Here is the official announcement from DCC. This past week there was a Terrorist attack in Manchester, England at an Ariana Grande concert. This attack basically targeted young girls who make up the bulk of Ariana Grande's fanbase. Also last week a man went to Phoenix Comic Con carrying numerous fire arms (3 guns), pepper spray, body armor and knives. In his phone he had a calendar reminder Kill JDF. He also began texting friends he was preparing to get in a shoot out with police, and to kill many of them. He had also begun to tactically take pictures of police at various locations in the con. This is a situaiton that could have gone down hill very quickly. Luckily he was apprehended by police before he was able to do anything. His aim however seemed to be to assassinate actor Jason David Frank most known as the Green Power Ranger. Jason David Frank is ok, the police are ok, and the con goers are ok. No one was hurt in Phoenix thanks to the police very quickly identifiying, and removing the threat. The show went on as ussual. When this awful stuff happens it often helps to look at the good. Homeless guys rushed to help victims in the Manchester attack, literally running toward the sound of explosives. It turns out there were no more bombs and they were able to help. However, there could have been more, what they did was undoubtedly brave. At Phoenix Comic Con the police swift action certainly deserves accolades. There were heroes at these places, and that always fills me with hope. The geek world though needs to step back and have some introspection. Geek Culture has been in the midst of a renaissance of sorts. We have been getting an amazing amount of attention from the film, tv, and video games and now have also been able to channel that popularity into conventions. There are now TONS of conventions. Anymore I stick mostly to Denver (Though I did almost head down to Phoenix) and there are about 10 events I plan on going to a year. At all of these events there are cosplayers who become part of the fun and attraction. However, some cosplays Deadpool, Walking Dead and Punisher come to mind use weapons that look like real weapons. I love both Punisher and Deadpool. HELL I was behind making a Deadpool Day on Sept 18th. People have gotten together at these cons safely for years but I thoroughly agree with Jason David Frank. Cons need to increase security. I am no security expert but I know that it will come at the cost of some of the cosplays that are common. Punisher, and Deadpool and really anything that uses weapons is going to need to be tweaked so that security can identify real threats. Likewise backpacks need to be checked for firearms or explosive devices. This stuff is not fun, its sad we need to discuss it but we do. I also want to commend Jason David Frank for his thoughtful and balanced response to this whole thing. He could hav easily said you know what? this convention thing is not worth it, I am never showing up again. For those who don't know Jason has a large martial arts business and he does not need to do conventions for financial reasons. He really does it for fans and the fun. The silver lining about him being targeted is that I know he can handle it. He is a true warrior inside and out and can not only bounce back but also use something like this for the better. I do recommend seeking him out at cons as he always arrives with this ADHD crazy energy and you can't help but love the dude. I can also say that he is a very good person. What does this all mean? I think we need to expect some changes. Cosplayers and con goers need to carefully read the rules before arriving because those rules might be changing. I could see them going toward a clear bags route that NFL stadiums have gone toward. I could all kinds of things. ALSO and this is big we as fans need to help with security. We need to keep our eyes open and alert security when we see something. We need to protect each other, the police and the celebrities by being observant. I know people are still going to complain when they show up and their cosplay is not allowed, or back packs are not allowed etc. Just know you have been warned and there are bigger things at play. Be aware of the policies before you go. Then like Jason says go and have fun. Expect some updates on this. I know Denver Comic Con is in about a month and I will be watching their policies to see if they change anything.